Pattison Outdoor Advertising is denying allegations that the company's decision to not run a Greenpeace billboard in Alberta was politically motivated. Earlier this week, Greenpeace questioned why its billboard on solar energy was rejected in Edmonton, while an ad denying that humans have an impact on climate change was approved for Calgary. Greenpeace said they reserved a billboard with Pattison — the country's largest outdoor advertising firm — in June 2012 following a large oil spill near Sundre. Greenpeace's ad was supposed to read: "When there is a huge solar energy spill, it's just called a nice day. Green jobs, not more oil spills." However, Pattison Outdoor cancelled the deal before the ad ever went up. Mike Hudema with Greenpeace says the group recently spotted a Pattison billboard in Calgary with an ad from Friends of Science. The billboard reads: "The sun is the main driver of climate change. Not you. Not CO2." Friends of Science are a Calgary-based climate change-skeptic group, that argues human-induced climate change is a hypothesis that needs debate. Its website calls climate fluctuations a natural phenomena. Pattison Outdoor president Randy Otto told the Calgary Herald that the decision not to run the billboard was "a business decision relating to Greenpeace," although he did not specify the issue. Hudema, however, said he's never been aware of any issues between the environmental group and Pattison Outdoor that would leave Greenpeace in bad standing. “To my knowledge, we’ve never had any negative comments. We’ve never failed to pay, or switched artwork at the last moment,” he told the Herald. Instead, Hudema says he's left to "wonder if there isn’t an agenda that (Pattison Outdoor) are trying to promote." "How can Pattison reject a billboard that promotes renewable energy, and approve one that tries to muddy a global scientific consensus and delay action on a growing climate crisis that is already displacing thousands?" he wrote on a Greenpeace blog. 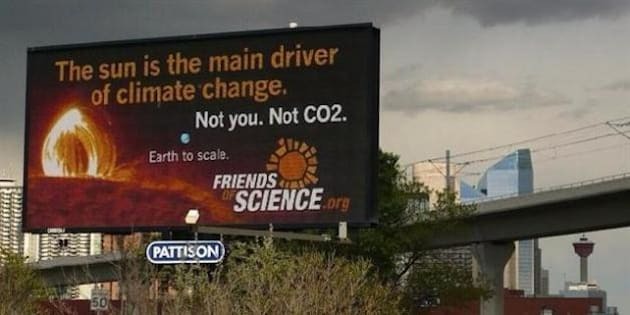 Meanwhile, Friends of Science says their billboard is meant to "stimulate civil public debate on climate change," and challenged Greenpeace's accusation of double standard over the billboards. "First of all, our message is backed up by peer-reviewed science. Secondly, we’re getting an excellent response from around the world,” said president Len Maier in a statement Tuesday. Pattison has been accused of bias several times in recent months, after it rejected a Vancouver atheist group's billboard last December, but accepted an anti-abortion group's campaign for Halifax buses. According to cantechletter.com, Pattison also rejected billboard space for an ad by Vancouver-based Voters Taking Action on Climate Change in 2011.